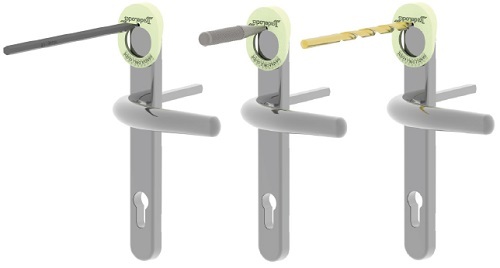 Please Note – The Door Handle Drill Point Template is only available as part of the Tradelocks uPVC Door Opening Kit! This clever Patent Pending handle drill point template from UAP has been manufactured to identify the fixing points on both short back plate and long back plate style door handles. It has also been designed to offer some glow in dark lighting, which will enable you to locate the drill point in total darkness! The door handle drill point template also removes the requirement to balance a torch under your chin, so you have total freedom of movement. All outer door handles have smooth surfaces, protecting and safeguarding the fixing bolts. These fixing bolts are typically fixed from the inside of the property. The Door Handle Drill Template is a very clever yet simple device to to locate approximately where the fixing bolt holes are. If the door handle is a short back plate then it will have 2 fixing points. One is under the lever and the other is near the bottom of the door handle. For the bolt near the bottom of the door handle you will need to hold the curved part of the template over the backplate and then mark a hole where the V groove is, and then use HSS drill bits and drill a 4mm or 5mm hole. You should then be able to see all or part of the fixing bolt. If not, then use a large drill; say an 8mm; until you eventually see the fixing bolt. If you then place a drill on the bolt it will either drill out or more likely unthread itself. Then turn over the door handle drill point template so that the curved part is facing outwards you and then put over the lever and let it hang down from the lever. Again, make a mark at the V and once again drill out the bolt. The door handle should now lever off easily. On long door handle backplates there are normally 2 drill points-one at the top, and one at the bottom. So use the handle drill point template exactly as shown above. On rarer door locks you may come across 3 bolts, with the third being under the lever as with the short backplate door handle. The new High Security Door Handles can mostly be tackled in precisely the same way, but this could take a minute or two longer to carefully drill out the drill points.